It's cold outside and nothing beats a good soup, and especially one you can make in minutes that is soothing and an ultimate comfort food. 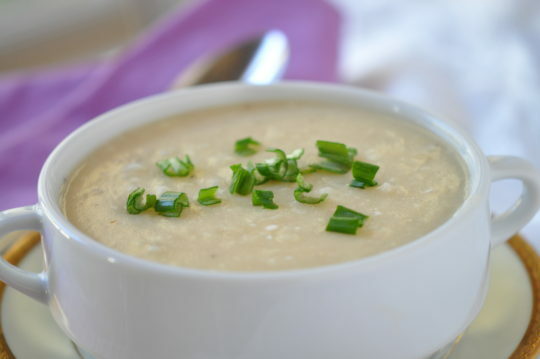 This simple soup starts with hash browns (no potato peeling) resulting in an effortless smooth and creamy soup. Top with condiments, if desired. This recipe is from Holly Clegg's cookbook, Eating Well to Fight Arthritis. Enjoy more delicious Holly Clegg recipes at hollyclegg.com. Terrific Tip: I like using Greek yogurt as it is richer and creamier than plain yogurt, while being protein-rich and low in sugar. Look for pre-chopped onion in the produce section of grocery. In large nonstick pot, combine hash browns, broth, and onion; bring to boil, reduce heat, and cook, covered, 8-10 minutes. In small bowl, whisk together flour with 1/3 cup evaporated milk. Add to potato mixture with remaining milk. Bring to boil, reduce heat, and cook, stirring for 5 minutes or until thickened. Remove from heat and stir in yogurt; don’t boil after adding, stirring until well combined. Season to taste. Top with green onions, cheese, and chopped turkey bacon when serving, if desired.